Often I find myself needing a convenient way to pick colours for CSS files and various other things, pretty much every single day. Unfortunately, it has always been a bit of a hassle, with no convenient tool for doing so — certainly opening up something like Photoshop just for choosing a colour is not ideal! I know there are hundreds of these out there already, but somehow none of them really worked for me. I decided to write (another) one, with the really imaginative name of 'Colour Chooser'. I originally wrote this app several years back and it did just enough to get by, however it was always lacking somewhat. I decided the time had come to finish it off and make it a little bit more useful, and put it up here in case it is of use to anyone else. If not — well it does the job for me. I'd like to point out that this is by no means a polished application. It works for me, and will hopefully work for you too. It provides for choosing a colour using the standard Windows colour picker, choosing from the screen, and copying the colour out in either hex form (#7DACBF), or in CSS RGB form (rgb(125, 172, 191)). It also allows varying the opacity of the colour which adjusts the second output to include the alpha channel (rgba(125, 172, 191, 0.6)). You can also type in either of the colour boxes to update the colour display. When picking a colour from the screen, the mouse cursor doesn't change (sorry). Don't worry though, it will capture your click correctly. If the choose from screen option is disabled, it is probably because the application is running with too little trust. This could happen if the file needs unblocking or is running from somewhere untrusted. There is no way to keep up to date besides returning here and downloading the latest version. Hopefully it'll be useful to you. If you feel there's something missing, let me know and I'll see what I can do. 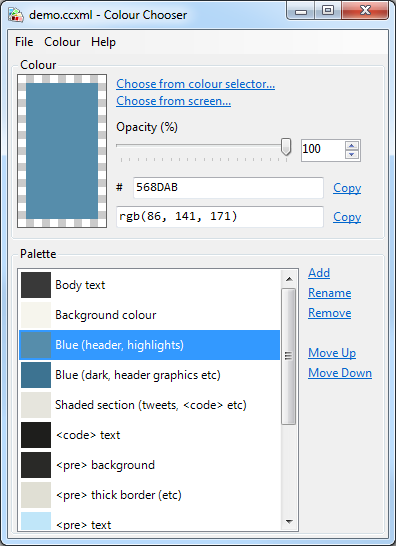 Added the ability to create a palette of colours and read/write several different palette formats. This makes it ideal for saving sets of colours for designs or whatever else for later use, and use across a team. The UI has been updated accordingly, with options for opening and saving palettes. There is now a contrast analysing tool and a few other minor feature additions. Several bug fixes, including the long-standing issue of lightening or darkening certain colours resulting in grey instead of the correct answer.